Deuel County is a county located in the state of South Dakota. Based on the 2010 census, the population was 4,364. Its county seat is Clear Lake. The county was created in 1862 and organized in 1878. It is named for Jacob Deuel, a legislator in 1862. Deuel is named for early settler Jacob S. Deuel. 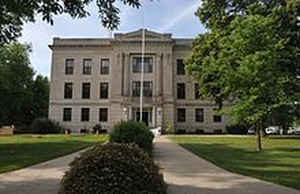 Deuel County was created in 1862 and organized in 1874. A sawmill gave Jacob S. Deuel, for whom the county was named, a start in Dakota Territory in 1860. Gary was made the county seat and remained so until Clear Lake became a town of importance, when it was moved to Clear Lake. Clear Lake takes its name from a near-by lake. The town was settled in 1884 and incorporated in 1900. As reported by the Census Bureau, the county has a total area of 637 square miles (1,649 km2), of which, 624 square miles (1,615 km2) of it is land and 13 square miles (34 km2) of it (2.07%) is water.